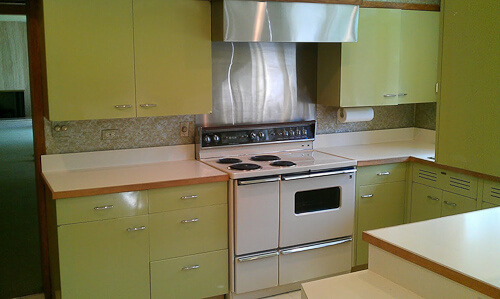 Look at this lovely St. Charles kitchen that appeared this week on our buy/sell Forum focused on vintage kitchen cabinets. 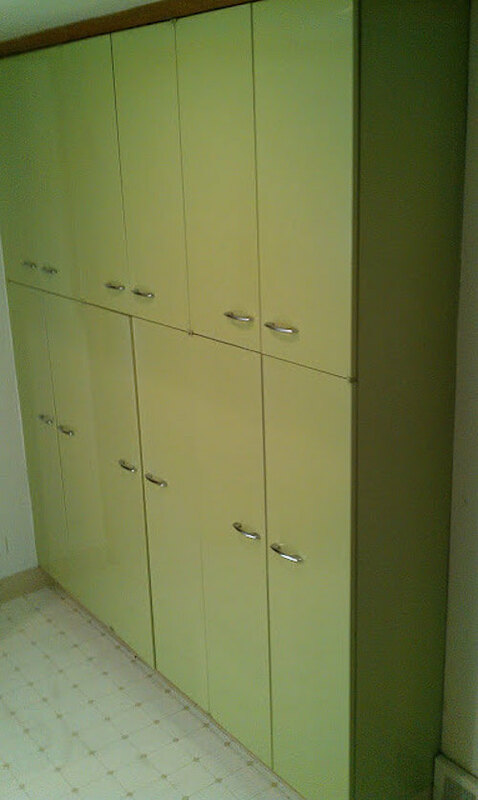 I love the color — the new owner of this vintage house says that he is told it was a custom color chosen for the cabinets, which were installed in 1964. The green in actuality reads like Sherwin-Williams Ryegrass, the seller says. 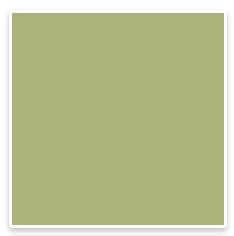 Interestingly, this color looks like it might be similar to the lovely Benjamin Moore Rosemary Sprig I showed earlier this week. As you can see, I’m into my greens these days. St. Charles is the best vintage kitchen around — these guys are HEAVY. In this design, I also love the kitchen table and how it swoops out from the compact and super-efficient u-shaped kitchen… The hanging wall cabinets are terrific… I love the simple off-white laminate countertops with oak (?) trim… and the wallpaper is delicious. 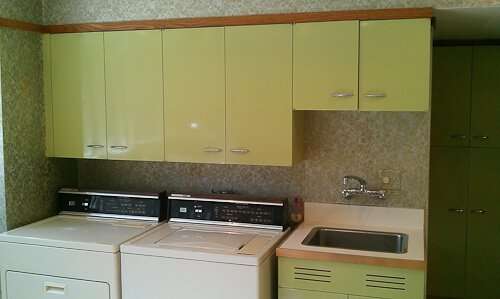 Note how the washer and dryer are right there in the kitchen — this was something that kitchen designers in the 1950s and early 1960s really pushed as a labor-saving design for mom. The house was built in 1949. 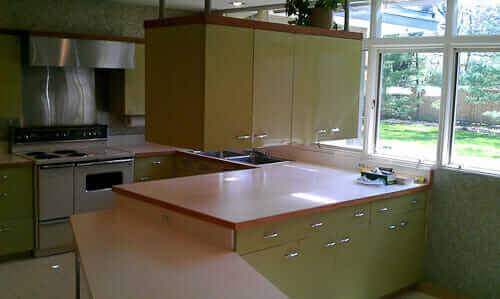 The kitchen was remodeled in 1964 according to the sellers. There are two refrigerators and a laundry chute. 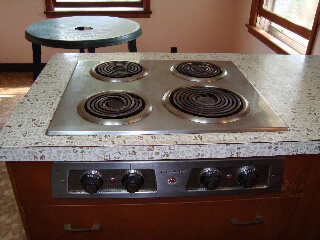 Today the architect told me the stove hood and vent system are equally “vintage” and were custom designed to fit with the cabinets. He said the vent casing is great and would be a great part of any vintage kitchen design. He also said the color is a custom color and the pulls are not standard St. Charles pulls. He noted the feet on the table legs are clear plastic – custom. 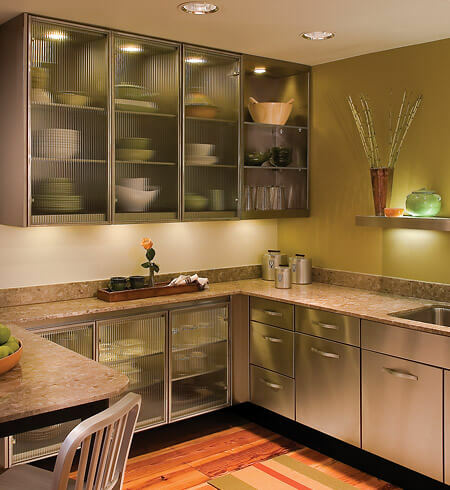 The island upper cabinets have electrical built in for under counter lighting. The wiring travels through the ceiling mount posts. The home is in Chicago’s northern suburbs near the lakefront. The architect was a former president of the Illinois chapter of the American institute of architects. 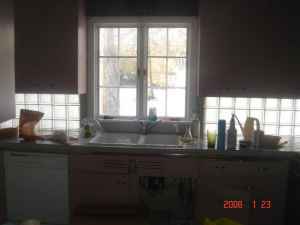 The kitchen is not “cheap”– it’s listed for $5,000. In recent discussions over on the Forum, we heard that a reader had been quoted about $800 for a NEW St. Charles base cabinet. Buying vintage can be a real hassle — you need to fit someone else’s kitchen into yours… you need to go pick it up, pack it up, store it… if the original finish is not in good shape, or the color not to your liking, it will likely be expensive to repaint and golly gee, those original finishes are hard to beat. But if you can find a set that works for you — I think they are a tremendous value. Interested? 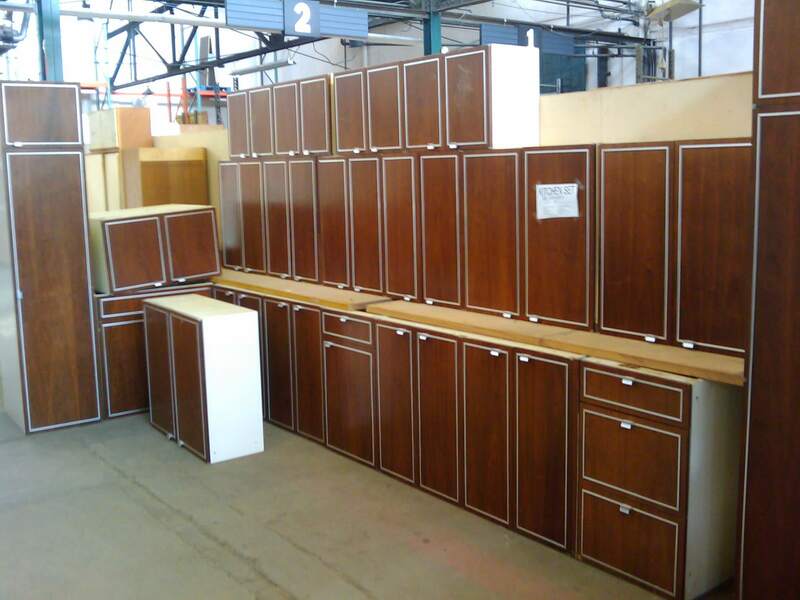 The cabinets are for sale in Chicago — see the link to our Forum listing here. Thanks to the seller for providing me with these additional photos to feature. Good luck finding a new home for this luscious kitchen. All material as published on Retro Renovation is copyrighted. Please contact me if you would like to use any images. I LOVE the color & the cabinets! The hanging/floating cabinets are AMAZING. These things are built like nothing else, I have the same set in a different color. They are so heavy & they have so many modern accessories. Although I favor the kitchen exactly how it is now, in the right setting these cabinets would look very modern & “designer magazine worthy”. Don’t get me wrong though, I think they are magazine worthy just like they are. The person who acquires these is going to be one LUCKY gal/dude. BEAUTIFUL! These are so good! Love those cabinets! Great pics! I love this kitchen! How amazing! We are in the process of putting a kitchen into our 1965 ranch that was kitchenless when we bought it. We are trying to be mindful of creating a kitchen that pays homage to the history of the house and the time period, but works with our needs. Posts like this help so much! Thank you! 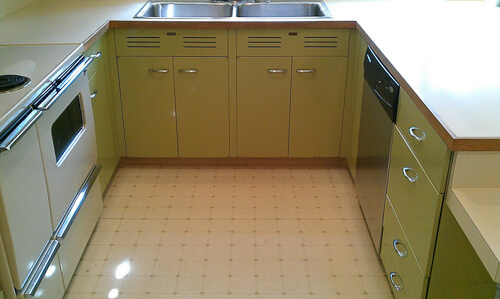 I have a 1965 St. Charles yellow kitchen that has a couple of problems and I would like to know if anyone has new cabinet doors in that color — also if anyone know how to fix a drawer that lost one of the wheels it rolled on. Also — the pulls in this photo look exactly like mine, which have never been changed since 1965.